Superior Keystroke Encryption technology encrypts everything you type in real time. SpyShelter Premium and Firewall offers a second layer of anti-keylogging protection called Keystroke Encryption (also known as keyboard encryption). SpyShelter is the first application in the world which encrypts keystrokes of all applications, regardless of the operating system language. Every Keystroke is encrypted on Windows Kernel level and sent via safe tunnel only to this application, on which your keyboard is focused. It locks out other applications from capturing those encrypted keystrokes. Once encrypted keystrokes reach the target window, they are being decrypted. This is a 100% system friendly solution – you will not notice any sort of input lag. All of your important private information will be securely scrambled from the moment you start your system. SpyShelter’s Keystroke Encryption driver currently supports both 32 and 64 bit operating systems and is available in SpyShelter Premium and SpyShelter Firewall. Our Keystroke Encryption driver is a second layer of anti-keylogging protection. 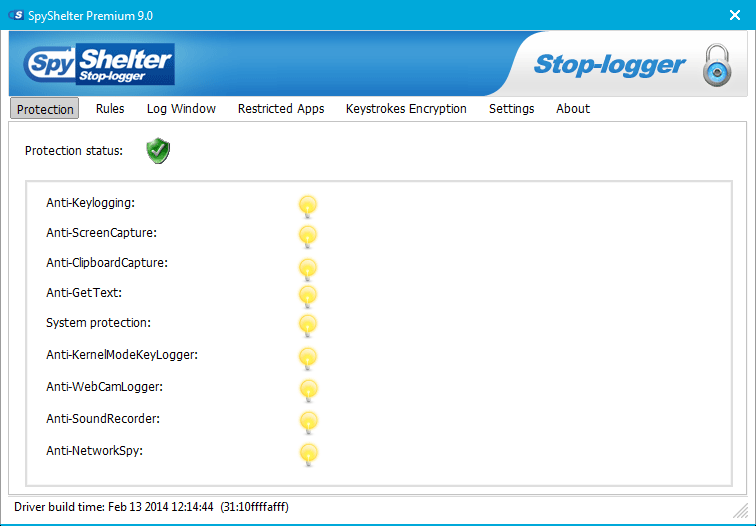 If you happen to allow a keylogger through Anti Keylogging module, SpyShelter Keystroke Encryption will keep you safe from data leak by encrypting all of your keystrokes.